We’ve published long form reviews on ergonomic mice since 2011. We really know which ergonomic mice are the best in the world. So what’s the best ergonomic mouse? Like our advice for the best ergonomic keyboard, you are going to need to try a few and find what works best for your work style, desk setup, hand size, computer platform, type of work, and a million other factors. However, we can recommend the best ergonomic mouse for most people. You can use the following table as a super quick guide to get in and grab a recommendation without much time. You can’t go wrong with these recommendations. 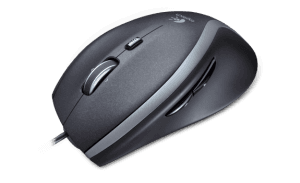 If you have time, below this table is our summary of all types of ergonomic mice and we recommend skimming the rest of the page to see if something catches your attention and should be on your consideration list to find your best ergonomic mouse. Want to dig in a little deeper? Below is our great big guide to all kinds of mouse options. We suggest reading through and seeing what jumps out. If you can bug a colleague who has one or visit a retailer that carries one, you may be one of the lucky few who can try before you buy. That probably won’t be true for you so we recommend you check the return policy of the retailer of your choice to make sure you can switch if the fit is not right. The Usual Suspects – You’ll recognize these, or their close cousins, if you’ve ever shopped for a mouse. The Arm Wrestlers – Straighten up that wrist! Many popular designs are focused on making your arm a blunt instrument. Let’s Go Vertical – Don’t straighten the wrist; instead, rotate it to a scientifically-calculated perfect angle. Trackballs and rollactioners – These are the ones that don’t move. Alternative Technologies – Why use a mouse at all? 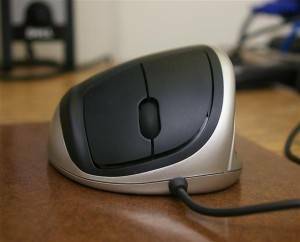 What makes a mouse ergonomic? If there were a device to measure the objective ergonomic benefit of a particular computer peripheral, choosing the one for you would be easy. You could simply look for the highest “ergonomic index” available, buy that, and ignore everything else. But of course this won’t work, because there is no objective standard of “ergonomicness,” anymore then there is an objective standard of comfort for shoes (or an actual English word “ergonomicness,” for that matter). Different things work for different people, and that principle is not going to change anytime soon. Your job is not to figure out what works for most people; it’s to figure out what works for you. But in doing that, it’s also helpful to have a basic understanding of the most common factors affecting user comfort. 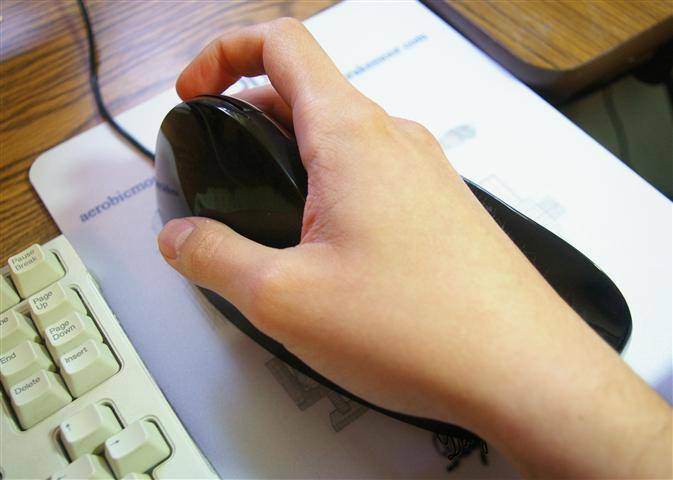 Many ergonomic mice are designed with the idea of reducing wrist movement. The reasoning behind this, while not shared by everyone, is simple: bending your wrist is what tends to deform the channels through which nerves run, so if you can stop bending your wrist, you are less likely to impinge a nerve. 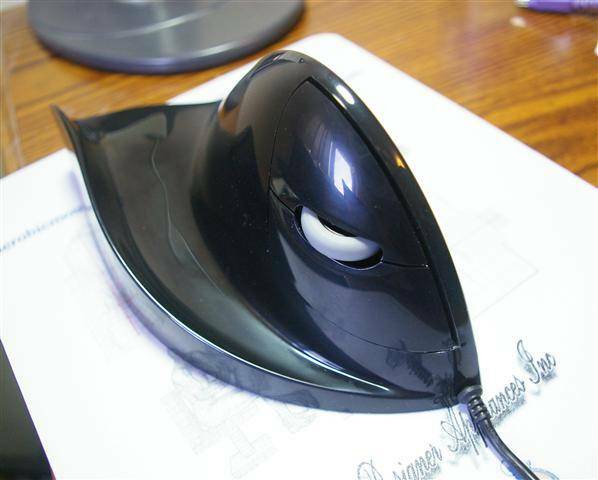 If a mouse is made large enough and shaped correctly, it becomes easier to control by moving your arm than by bending your wrist. The Airobic is an example of a large mouse designed to be moved with your whole arm. Precise motions are difficult – but so is the “wrist flick” often blamed for carpal tunnel syndrome. When the focus is on reducing wrist movement, one thing typically goes overboard: precision. While your arm is big and powerful, it is not made for doing precise tasks. For example, imagine trying to write with your arm in a cast from fingers to elbow. You could probably do it, but only in very big letters. It’s the same with mouse control. You can accomplish quite a bit using the large muscles of your arms, but you may struggle with precise tasks like pixel-perfect work in Photoshop. If your work involves many such tasks, you may prefer an ergonomic mouse design that reduces wrist movement the other way – by transferring the load to your fingers. 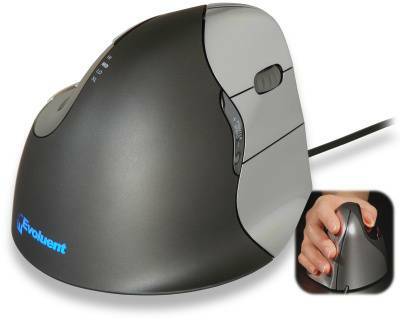 Most ergonomic mice make an effort to get your palm out of the horizontal plane. Some go entirely vertical; others, like the Rockstick shown here, choose a compromise angle. To understand pronation, sit down in front of a desk or table about elbow height, and lay your hands comfortably on the table in front of you. Now look at your hands. If they are totally flat, with palms straight out on the table, then you are either a very unusually shaped person, or else you didn’t really relax. Because of the way the human body is built, it requires effort to flatten your palm in a downward position. This effort isn’t very large, but the strain can build up significantly over time if you use a mouse that puts your palm straight down. At the other end of the spectrum from pronation is the vertical mouse position. While putting your hand at 90 degrees gets it as far as possible from total pronation, it must be noted that straight vertical is not the most natural and comfortable position for most people either. Rather, the hands of most users will land somewhere between zero and 90 degrees when relaxed. Different mouse manufacturers choose different angles to proclaim the “most natural.” If you can’t decide which is right, you’ll be glad to know that at least one (Oyster) makes the angle adjustable. Okay, enough theory. Let’s look at some products. List price of $29.99 as of this writing, the Logitech M500 is a good example of a low-end ergonomic mouse. 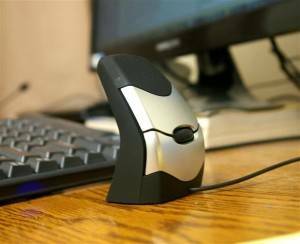 Walk into Staples or Walmart – or pretty much any store that sells computer peripherals – and you will generally find at least a couple of “ergonomic” mice offered for sale. Whatever their particular shape or claim to fame, one will probably be by Microsoft and another by Logitech. Generally, the “consumer-grade” ergonomic mouse (costing about $50 or less) will have some kind of sculpted body that intuitively feels pretty good when you grab it. There will usually be a rubberized coating, lots of buttons, and – on better models – some highly vaunted tracking accuracy. (“Our mouse tracks upside down, in the rain, on gravel!”) In case you’re wondering, that tracking accuracy is mostly for gamers, who also tend to need more pain relief than most. One thing can be said for Any Old Ergonomic Mouse: It’s probably better than the one that came with your computer. The shape and coating typically found on these mice will most likely do you some good, and the cost is less painful than an ergonomic mouse of the “professional” grade. That said, even the less expensive models from Microsoft and Logitech will put you halfway or more to something quite a lot better – something like the Evoluent or DXT vertical mouse, which will actually address the systemic ergonomic issues with standard mouse designs. As part of its renovated Sculpt ergonomic line, Microsoft has rolled out a mouse to go with their distinctive second-generation keyboard (the one that looks like a manta ray). If the keyboard is a manta ray, then I suppose the mouse must be clam. Or maybe it’s just a smooth rock, with one corner notched out by erosion. The surprising thing about this very simplistic looking design is that it is actually very comfortable to use. Like many large mice, the Microsoft Sculpt fills up your hand completely, leaving your fingers hanging over the front and a relaxed position. Clicking this mouse is very easy, and actually reminds me quite a bit of the nearly-effortless Contour action. This isn’t so much because of the buttons themselves as because of the aforementioned shape; your fingers, being stretched out and free to move from their largest basic joints, can attack the buttons at maximum advantage. 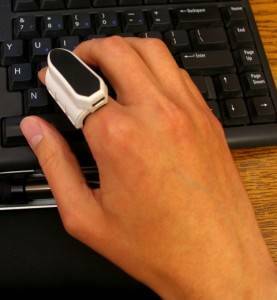 This is in contrast to small, finger-curling mice which tend to be clicked with the outmost and weakest joint of the finger. 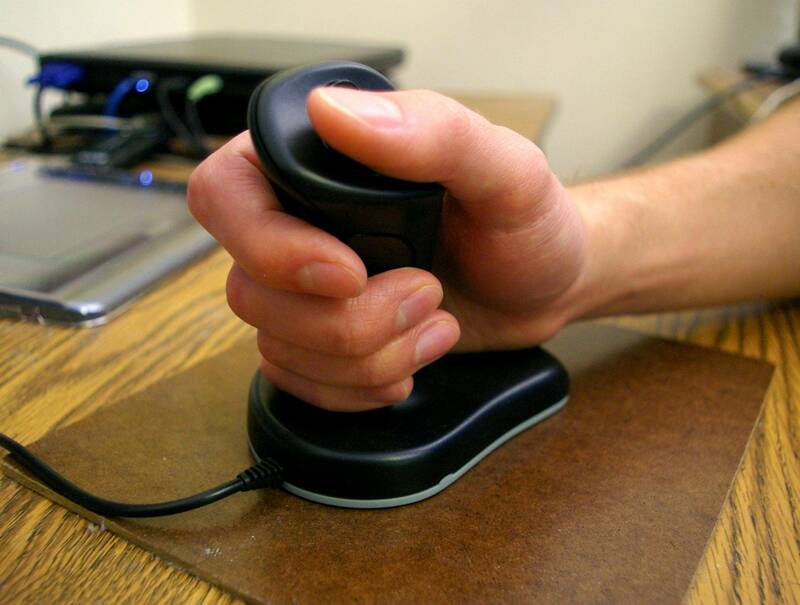 As a step above the “any old ergonomic mouse” we mentioned earlier, you could do a lot worse than the Microsoft Sculpt. And if the Sculpt keyboard has caught your fancy anyway, you might as well spend a bit extra to get the whole set, and the benefit of a common receiver for the two devices. Price: List is usually around $40 but often goes on sale. Check latest price here. Click here for my review (also covers the Sculpt ergo keyboard). The Goldtouch Comfort Mouse is a little more substantial than its undistinguished Microsoft and Logitech cousins. 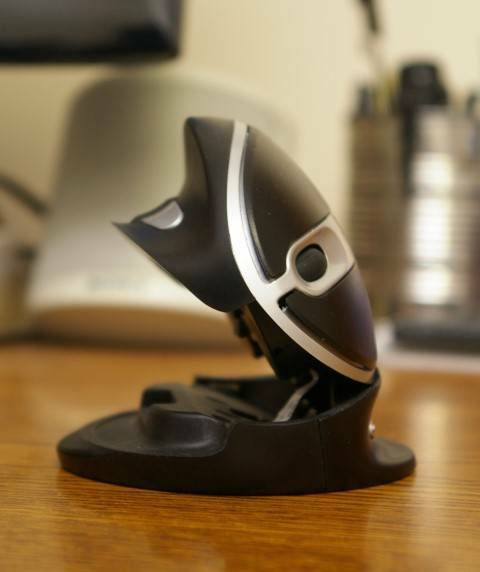 In general feel and utility, it’s quite similar to the Microsoft Sculpt mouse we discussed. If you are getting a Goldtouch keyboard, it might make sense to get the Goldtouch mouse as well and keep everything under one umbrella. The Goldtouch mouse also offers optional Bluetooth support, which is unusual for an ergonomic mouse and handy if you’re planning to use it with a tablet. Price: List is usually around $60 but often goes on sale. Check latest price here. Can’t decide whether you want a fully vertical mouse or one that’s more nearly flat? Instead of investing in a lot of different mice, you might consider the Oyster, which is adjustable in five levels from 90 degrees on down. Disadvantages of the Oyster mouse include its build quality, which is somewhat less than stellar. The thing actually feels a bit creaky and cheap, but not so much as to ruin the experience of using it. It is evidently undeserving, however, of the bad rap it gets for “breaking” when adjusted. The majority of the time, in appears that the mouse gets broken because people try to reduce the angle without first releasing the adjustment gear (which is done by lifting the mouse all the way up and then pushing it back down). My understanding is that the latest version of the Oyster mouse will have a a safety catch to prevent this from happening, which I hope will end these issues and the unfair blame that derives from them. In case you are wondering if it’s possible to pinch yourself with the Oyster, the answer is that it is possible. However, I would hasten to add that it is also possible to hurt yourself with scissors, doors, file cabinets, etc. The Oyster is not likely to come down by accident on your finger; it is locked in place during use. The only way you are apt to pinch yourself is during the act of adjustment, and even in that case you would have to be exceedingly clumsy to get your finger in between the pieces of the mouse. The Oyster is available in both wired and wireless versions. The previous wireless version used a “wake” function that worked in a way that didn’t make sense, but this has reportedly been corrected with the latest build of the mouse. Price:List is around $130 but often goes on sale. Check latest price here. Taking a more or less “standard” ergonomic mouse shape to start with, the Newtral2 provides a different slant on the Oyster’s principle of adjustability: instead of having moving parts, the Newtral2 features interchangeable pieces that attach magnetically to the mouse. These removable flanges are designed to provide varying degrees of support to your hand while working, helping you strike the right balance between the precision of an “ordinary” mouse and the ultra-comfort of an arm-operated design. Price: List is usually around $65.00 but often goes on sale. Check latest price here. These are the mice we talked about earlier – the ones that do their best to save you from carpal tunnel (and from yourself) by paralyzing your wrist. While this may sound unpleasant, all the mice on this page are easy to use as long as you don’t require a high degree of precision. I have a special place in my heart for the Contour mouse. It was the first ergonomic mouse I ever purchased, back in 2007 when ergonomics (and computers, for that matter) were still fairly new. I used it exclusively for a number of years, switching over only when my physical situation changed beyond what the mouse could address. 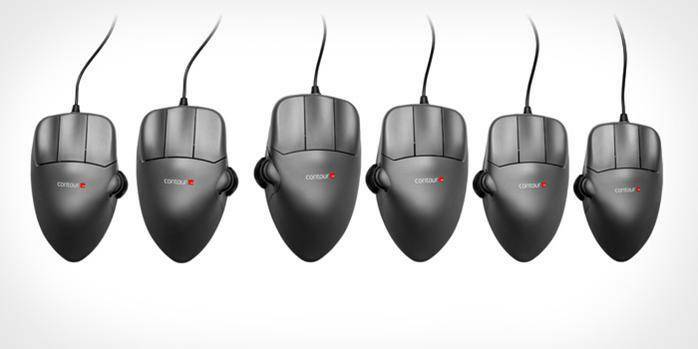 The Contour mouse is not adjustable; instead, it comes in multiple sizes like an article of clothing, and in right and left hand versions. In any size, the mouse is sculpted with the intention of “filling” your hand when you grip it. It has been likened to the feeling of shoes with an arch support, and I think that’s pretty accurate. The Contour mouse was designed so that users would maneuver it with their entire arm, keeping that arm straight from elbow to fingertips. As we discussed in the intro (you did read the intro, right? ), this approach tends to reduce precision. So, the Contour mouse design also allows for a secondary mode of use called “precision mode,” where the heel of your hand rests on the work surface (best to get a soft mouse pad) and your fingers operate the mouse. Because of the above issue with precision, the Contour mouse works best with low pointer speeds. This wasn’t a problem in the year 2000, when the coolest kid on the block had a single 17″ monitor. But it is a problem now in 2016, when even the technologically underprivileged often have two large monitors, and sometimes three. You can’t use low pointer speeds with this kind of setup, because you’ll end up making four trips across the mouse pad for one trip across the screen(s). The bottom line? The Contour mouse remains a great device, but it doesn’t do well with the most current technology. Best for single-monitor setups, laptops, and those who plan to use Precision Mode all the time (which kind of defeats the purpose of the mouse). Price: List is usually around $120 but often goes on sale. Check latest price here. It has been a few years since I tested the Handshoe, which was one of the first products we featured on the All Things Ergo blog (back when it was Ergonomic Info), but I still remember the extreme comfort offered by the device for the weary user’s hand. The Handshoe is a great choice if comfort is your top consideration, you do not require precise movement capability, and you do not have multiple large monitors. If you do have multiple large monitors, read the part about Contour above and choose another mouse. Price: List is usually around $140 but often goes on sale. Check latest price here. As far as I know, there is only one mouse that combines enforced arm movement with a 90° vertical design. That mouse is the AirO2bic, formally known as the Quill mouse. Everything I have said about the Handshoe and Contour mouse applies here: it requires lots of room to move, and works best at low speeds on small monitors. It also suffers from buttons that are, in my opinion, rather difficult to click, so the use of click-free software is recommended with this mouse. AirO2bic is another product that has probably passed its heyday. With multiple monitors the norm and more innovative designs taking over, I don’t see too much of a market slot for it anymore. However, it may provide a saving grace for people who are desperate, but not quite desperate enough to use a foot mouse. I cannot speak for the current supply situation on the Airobic mouse, as its inventor passed away a few years ago, and I have not talked to anyone responsible for the product since my conversations with him. It does seem to be available from some online retailers. Price: List is usually around $100 but often goes on sale. Check latest price here. Remember that bit about pronation earlier? Here are the top mouse designs that attack pronation by putting your hand that is either vertical or very nearly so. I am not sure if most people are going to be stoked to measure their hands and weave through all of the options to select the best version of a mouse. While this may be out of the ordinary for most people purchasing a mouse, I can clearly see the advantages of getting a properly sized mouse. Give it a try! 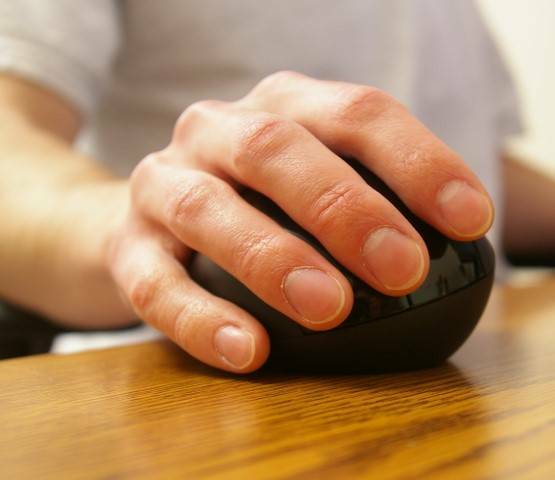 Getting a right-sized mouse may make the difference in your search for the most ergonomic mouse. This USB wired model tested is only for right-handed people and the Anti-RSI software is only for Windows users. Right-handed Windows users represent the majority of the market right now so most people should be able to use the mouse that I tested. Left-handed people or folks needing a wireless version have options here. R-Go Tools also makes six other versions that are identical in features except it doesn’t come with the Anti-RSI software. If you are a Mac user, I would recommend getting the version without the Anti-RSI software as those models cost less and you won’t miss any of the ergonomic features. Price: Around $90. Check latest price here. If I could put just one ergonomic device on every desk in the world, it would probably be a DXT mouse. In a design that’s smaller than an ordinary mouse – and just as intuitive to use – the DXT smoothly corrects some of the worst problems with conventional pointing devices. It’s not just the vertical shape, which gets your palm out of that flat posture ergonomists love to hate. Lots of ergonomic mice are vertical, but few are so precise and easy to manipulate that you feel like you’re using a pen. Even fewer have ambidexterity built in, plus switching between four DPI settings for maximum flexibility. If there’s a downside to the DXT, that downside would be in its lack of buttons relative to certain other mice such as the Evoluent. The DXT has just two, plus center-click on scroll. The buttons it has are quality, though, with click force issues from earlier editions addressed in the latest DXT mouse. And of course, the number of buttons involves a tradeoff; if the DXT had more, you’d lose the tiny footprint and pen-like precision that help to make this neat little mouse what it is. There’s much to be said for a minimal device that does just one or two important things, and does them right. Price: List is usually around $100.00 but often goes on sale. Check latest price here. This is the fighter jet of ergonomic mice, with so many buttons and options you’ll never run out of new ways to use it. It also claims the title of the first true vertical mouse on the market. 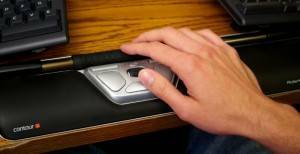 The Evoluent vertical mouse puts your hand at 90° to the desk, completely counteracting pronation. It is a large design – too large to be moved with just your fingertips. This makes it less precise by nature than the DXT, but it also allows the Evoluent mouse to have lots and lots of buttons – five in all, including the click on the scroll wheel. Evoluent also distinguishes itself with a really nice driver program, which allows you to reassign all those buttons on a per program basis. Designers, developers, and other power users can take this strategy as far as they like. Shown here with the optional “ledge” piece, the Rockstick2 feels very nice and relaxing in my hand. Precision, of course, is another matter. 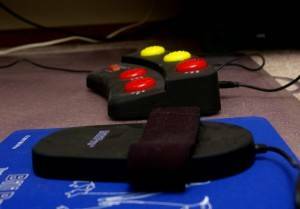 The Rockstick Mouse is intended to combat certain hand injuries by eliminating the need to click. Instead, you “click” this mouse by rocking the upper half of its body to one side or the other. If you have a disorder that is aggravated by clicking, this could be a lifesaver. It certainly was for its inventor, Jianbo Deng, who developed it out of necessity to address his own issues. The downside to the Rockstick is a certain lack of precision, a known issue that the manufacturer attempted to address in the second version of the mouse. What had previously looked like a 3M joystick style mouse now more resembles a DXT, but still falls woefully short of the precision found with that device. The Rockstick has interchangeable pieces to change its shape: There’s a flat hand rest that will help you relax your hand but pretty much destroy precision, and an abbreviated side piece that will give you a little more precision – but risk running over your fingers while you’re working. I recommend the Rockstick for users who have a problem that is definitely aggravated by clicking. Otherwise, I don’t think the precision trade-off is worth it, and the mouse may cause more problems than it solves. 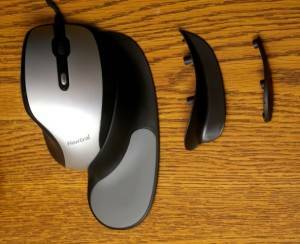 I am including the 3M ergonomic mouse mostly because I previously reviewed it on this blog. Objectively, there’s not much about this mouse that others don’t do at least as well. 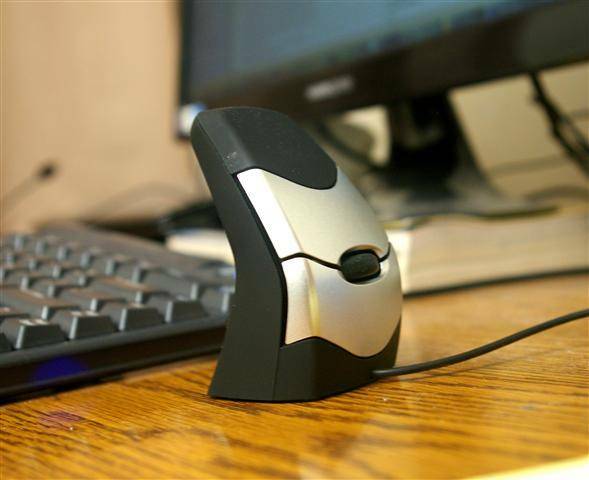 The 3M mouse is a fixed-platform vertical mouse, which means that your whole hand is supposed to rest on the mouse while you’re using it. In this respect it is quite similar to the old Airobic mouse – only instead of a full-body grip structure, the 3M has a joystick-like “post” in the middle to wrap your fingers around. Clicking is done with a button on top of this post, and alternate click functions are accessed through buttons on the side. Price: List is usually around but often goes on sale. Check latest price here. That’s it for mice, as such. Now let’s look at the wonderful world of trackballs and rollers. Yes, these are not technically mice (even though one of them goes by the name), but the stationary roller/ball devices are worth checking out too. In this section, in fact, is my own current weapon of choice: the Contour RollerMouse Red. Trackballs, which appeared a lot in the computer advertisements from the 1990s, seem to be getting a new lease on life with the multiple-large-monitors setup that is becoming typical these days. This may be because trackballs can “scroll infinitely,” i.e. you never run out of room as with a mouse. 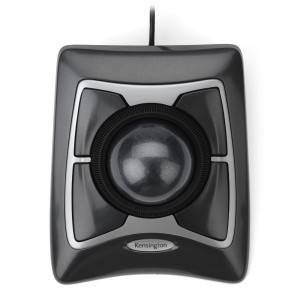 Among trackballs, the Kensington Expert is often mentioned as an “ergonomic” choice, mostly due to its large operational component – a ball the same size as the one used in billiards. Having a large ball just “feels” better, and provides tangible benefits in precision. Issues with the Kensington Expert include its very unhuman-looking shape; no comfortable curves, though the company took a stab at ergonomics with a padded wrist rest you can attach to the trackball. However, this wrist rest does not resolve all the issues. The trackball is still sloped upward away from the user, which tends to make the wrist angle back unhealthily unless the work surface is really high up. When it comes to its buttons and scroll wheel, the news is both good and bad. 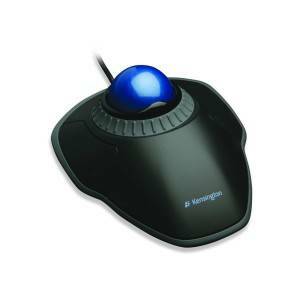 There are four buttons, and all of them can be programmed using Kensington software. However, due to the shape of the unit, none of these buttons is in an area that is particularly easy to get to while you are using the thing. Also, the scroll wheel tends to be very “rough,” feeling like sand has somehow gotten into its bearings. However, it should also be noted that most trackballs do not have a scroll wheel at all. Price: List is usually around $75 but often goes on sale. Check latest price here. While the Kensington Orbit doesn’t have the billiard ball sized business and of its distinguished relative, the Expert Mouse, it does have something that neither the Expert nor most other trackballs can claim: a really excellent scroll wheel. The scroll wheel on the Orbit is a ring around its standard-sized ball. You rotate this ring like a steering wheel in order to scroll. This feature is tremendously well-built, and in my experience, it does not tend to start grinding, skipping, and otherwise malfunctioning in its old age. If there is a drawback to the Kensington Orbit, for me at least, it would be the fact that its primary click button is intended to be operated with the thumb. There is by no means universal agreement on whether or not the thumb should be utilized like this, but my own very strongly held opinion is that it should not. That said, I have a family member who has used the Orbit as her primary pointing device for years, and she couldn’t be happier with it. The RollerMouse Red, my hands-down favorite of the Contour lineup. When you first look at a Contour RollerMouse, your initial reaction will probably be “that ain’t no mouse.” (Or it might be “that isn’t a mouse,” if you do not hail from Flyover Country like me.) 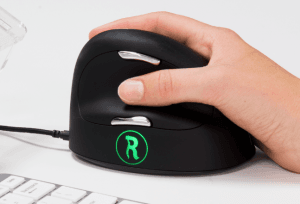 The RollerMouse is a somewhat weird yet very wonderful new approach to mousing. It really works more like a trackball than a mouse, only a trackball that is made in the shape of a knobby rubber rolling pin. 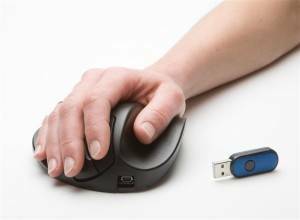 It might at first look difficult to control the mouse pointer with this device, but over and over again, users try it and immediately take to it like bureaucrats to red tape. The RollerMouse Free2 (top) is both smaller and thinner than the Pro. There are three different types of RollerMouse available: Red, Free, and Pro. The Pro is the “legacy” version, and you can pretty much forget it unless you happen to have a very low keyboard tray that requires a very high palm rest. Even if you do, you will still probably do better with the RollerMouse Red, which is almost as thick as the Pro, and beats it all to smithereens in every other area. The Red was introduced in 2013, and represents a quantum leap forward in RollerMouse technology. Where the previous versions had a problem with “running out of screen,” the RollerMouse Red almost never hits its physical limits when moving the pointer. You can use it like a trackball, with multiple monitors, without undue fear of bumping one end or the other while working. The third sibling in this lineup, the Free, is a decent device in its own right, but the slightly lower price does not compensate for the missing benefits of the Red. Choose the Free only if you need a very thin-bodied RollerMouse – typical for higher work surfaces. If you can afford it, the RollerMouse Red may be the single best all-around pointing device available today. However, affording it is an issue for some people; the base unit costs $265 at the time of this writing – more if you choose the ArmSupport Red accessory. Price: List is usually around $275 but often goes on sale. Check latest price here. My reviews: Red; Free; Pro. Still reading? If you’re desperate, the Last Chance Cafe is just ahead…. If the DXT mouse mimics the feel and performance of a stylus as much as possible while still remaining a mouse, the Penclic design explores the same idea without any restriction on the resulting shape. I always describe the Penclic as being like a pen stuck or hinged to its inkwell, with the inkwell being the base of the mouse and the part that contains the optical tracking sensors. The operational buttons in scroll we are on the “barrel” portion of the Penclic. This part, I might add, is much improved in the second-generation of the Penclic mouse. Previously, there were more buttons, but the buttons were less useful because they were of the small and difficult to press variety. Now there are just too big ones, but they are easy to press – assuming you take time to adjust the pen for your “writing” position by rotating the barrel against its base. This rotation is not exactly intuitive, or else I am just stupid. When I reviewed mine, I simply did not realize that the barrel was capable of rotating. This put my hand in a rather awkward position for clicking, that problem was quickly resolved when I figured out the rotation part and adjusted it to my preferences. Penclic is not as ultra-precise as a stylus, but it is at least as precise as any mouse on the market, ergonomic or not. 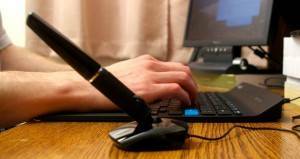 It is extremely adjustable, and the pen grip provides a different experience that many users will appreciate. Your foot wasn’t really meant to move a mouse. Of course, in point of fact, your hand wasn’t either – God made man; man, in one of his many errors, made computers. But I digress. Where the fingers, and even the whole hand, are used to doing things precisely, the feet are not. That said, a foot-operated mouse is a viable last resort for those with hand issues that cannot be otherwise resolved. The foot mouse I have tried is the one from BiLi. I found it to work about as well as one would expect from a foot operated mouse – usable, but utterly imprecise and actually kind of stressful for me. Can you get “carpal foot syndrome” from this? I doubt it, but maybe someone will comment here and prove me wrong. Price: List is usually around $150 but often goes on sale. Check latest price here. As technology improves, people are always trying to leverage the new technology for new and innovative ways to interact with computers. Gesture-based mousing is one of these new ways, and I expect that it will improve and grow quite a lot the next few years. The only really viable gesture-based device I’ve tried is the Mycestro, which clips onto your finger and is meant to suggest the idea of the conductor’s baton in principle. On my test drive, I found it quite usable (once I got the settings adjusted correctly), but I don’t yet have a view on whether or not such a gesture-based mouse is really good for economics. With a device like this, which will allow you to use it in a variety of positions ways, ergonomic benefit depends more on the user. That’s it for now! Let us know if you want us to add mice to this list. We hope you find the best ergonomic mouse in the world right for you.